Mark H. and Betsy Nagelsen McCormack formed a husband and wife team whose vision, dedication and generosity have created countless new opportunities in women’s tennis. With their gift of the McCormack-Nagelsen Tennis Center at the College of William & Mary, they have provided an ideal home for the intercollegiate Tennis Association’s Women’s Hall of Fame and an inspiring site for future champions. Mark McCormack revolutionized the world of sports as founder of the sports marketing industry. Beginning in the early 1960’s he built his company, International Management Group, into the world’s largest athlete representation and sports marketing firm. A highly creative and dynamic entrepreneur, McCormack diversified IMG’s interests to encompass corporate consulting, licensing, television programming and distribution, artist representation and marketing of events such as Wimbledon and various Olympic games. McCormack also became a best-selling author whose books include What They Don’t Teach You at Harvard Business School. 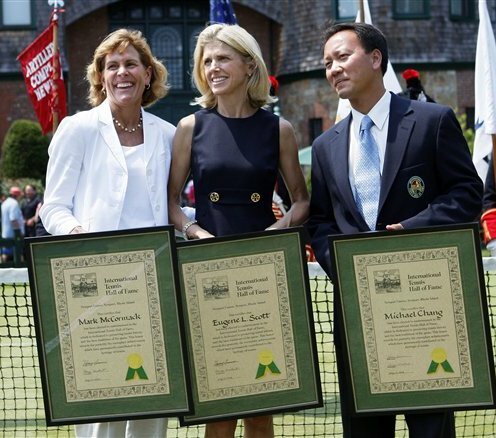 Often called “the most powerful man in sports” and recognized as the most powerful man in tennis, McCormack has helped to change the face of women’s tennis. On the professional level his advocacy on behalf of players and his promotion of tournaments worldwide has brought tremendous new support and interest for the game. On the intercollegiate level McCormack provided the first women’s tennis scholarships at his alma mater, William & Mary, enhancing the team’s competitiveness in NCAA Division I play.